Can MTV repeat the TV remake success it's enjoyed with the likes of Teen Wolf with its new television reboot of the Scream movie franchise? After four movies which put a postmodern spin on the slasher horror genre where teenagers were targeted by a masked murderer (which ran from 1996 to 2011), the concept is getting a modern day episodic update with smartphones and social media being the new weapons of terror (oh, and knives of course). So far the most controversial thing about the TV reboot of Wes Craven and Kevin Williamson's big screen original, which acknowledged and parodied traditional horror movie conventions, is the replacement of the iconic 'Ghostface' killer's mask with a new version. 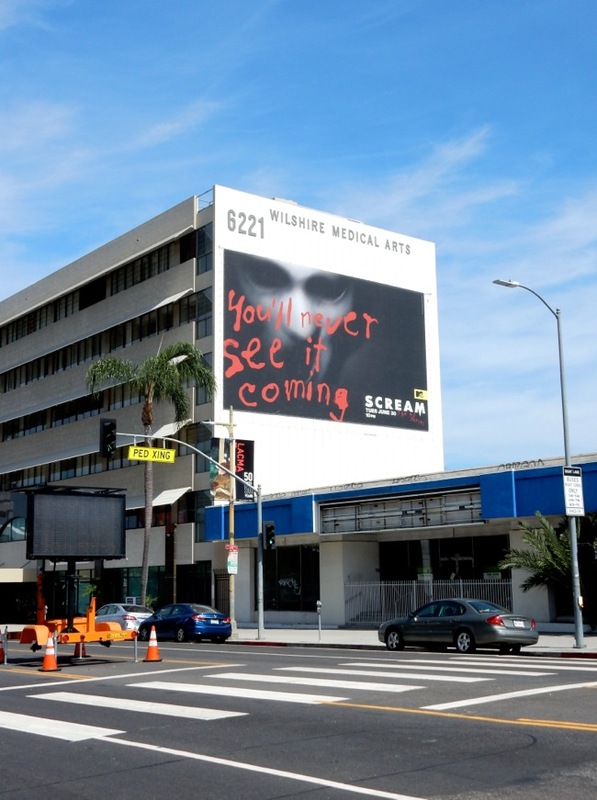 This series premiere billboard for Scream: The TV Series was snapped along the Sunset Strip in West Hollywood on June 24, 2015. 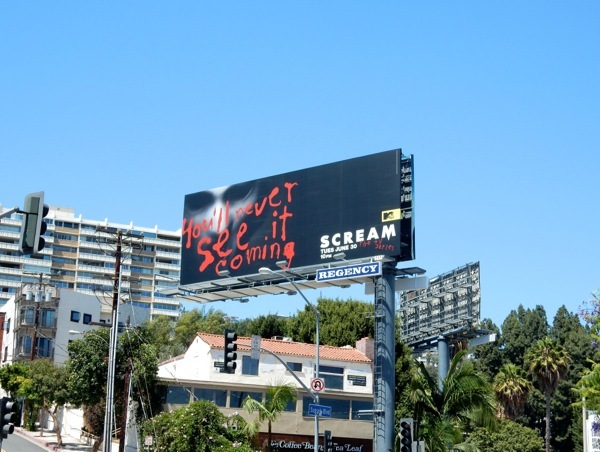 With Scream Queens also debuting on Fox this Fall, teen slasher shows are obviously the new TV trend this year. Only time will tell whether you'll never see the twists ands turns coming in this bloody TV reinvention, and if the show can sustain the mystery, terror and gore for an entire season. 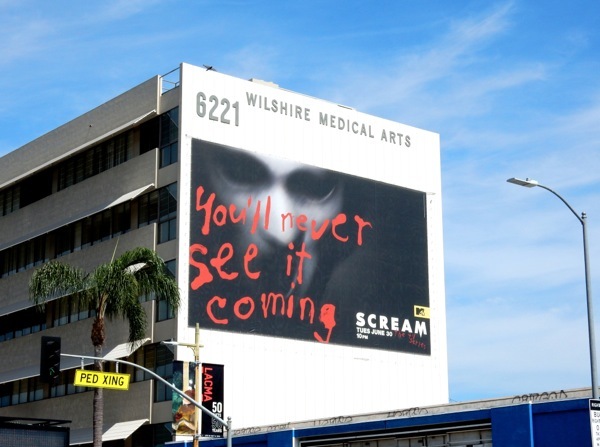 UPDATED: Here's also some extra support for the new TV series in the form of a super-sized billboard along Wilshire Boulevard. 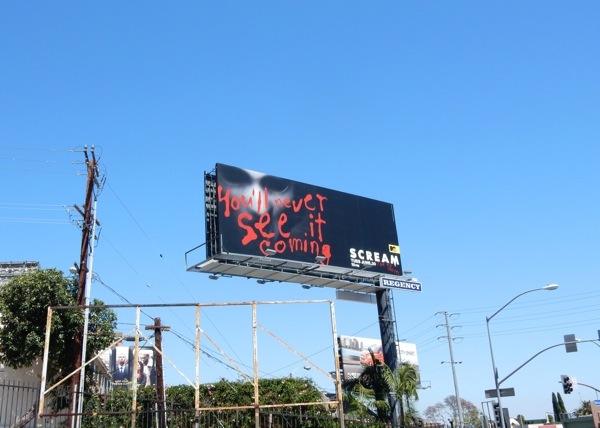 "You'll never see it coming", but you can't miss this giant billboard snapped on July 11, 2015.